Look below for more info on our packages & processing. Choose the credit card terminal below that best fits your business. Dial-up: DataTran for a $695 savings. Broadband: IPTran for a $795 savings. Broadband w/ Dial backup: TwinTran for a $1199 savings. Call us at 239-693-3800 for more details. Here is all you need to do... Easy as 1, 2, 3, 4! 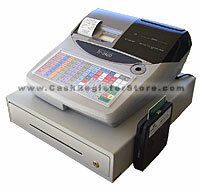 Buy any one of the following listed cash registers below. Our rates are VERY competitive + we will BEAT your current rates. We program your credit card terminal, ship it and your cash register. When your products arrive, call 239-693-3800 for FREE set-up assistance. Interface any of the following cash registers below directly to a credit card terminal as shown to the right and receive the following advantages. Buy any of the above listed cash registers, and take advantage of a gift card program. Gift cards are great promotional tools to increase sales and company awareness. Click here for more info on gift cards. Don't really need a terminal, but want LOWER processing rates? We will BEAT the current processing rates that you already have! Call us at 239-693-3800, to see how much we can lower your rates. Do you need funds to start, grow or help float your business during tough times? Get Sterling Funding! Sterling Funding is easy, quick and painless. Click here for more details. Verifone 1000 SE - For Dial-up only - Standard pin pad debit entry - Integrates to DialTran. Verifone SC-5000 - For Broadband only - Incorporates mag card reader & pin pad in one unit.